A high vitamin K and protein recipe that helps me reduce my INR through foods. Small enough to eat as a snack or great with a salad for extra vitamin K. I love this for days that I my INR is high or if I can't get my amount of vitamin K or protein in my day. Easy to prepare and great easy to store. Even easier to eat, yum! I love Kate Harrison's recipes and she has a number of books available for brilliant recipes. Preheat the oven to 200°C, 400°, Gas Mark 6. Spray a nonstick frying pan with 1-cal cooking spray, add the mushrooms, season well and fry over a high heat for 3-4 minutes, until they start to turn golden. Add the garlic and fry for a further minute and then add the spinach and leave to wilt for 1 minute. Remove from the heat and set aside to cool. Drain off any excess liquid. Whisk together the eggs, milk and half the Parmesan in a bowl. Season well and then stir in the mushroom and spinach mixture. Line a 6-hole muffin tin with paper cases or simply lightly grease each hole with 1-cal cooking spray. 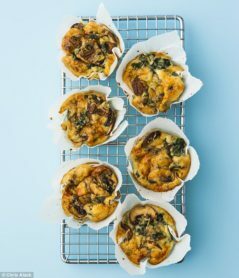 Divide the egg mixture between the cases and sprinkle the tops of the muffins with the rest of the Parmesan. Reheat the muffins in the microwave for 25 seconds. If you don’t have a microwave, reheat in the oven at 180C/350F/gas mark 4 for 5 minutes or until warmed through. This is a high Vitamin K food, I use them to reduce my INR sometimes or as my daily allowance. You need to remember that it’s not only high in vitamin K but also protein from the eggs. One of these muffins will give you almost a woman’s daily minimum requirement of Vitamin K. It depends what you set your daily amount at. I set mine at 150mcg per day so 2 of these yummy muffins almost meet my daily allowance. However if you want to, why not add some spinach at the end of the cooking process to increase your vitamin K. 1 handful (25g) gives you an additional 98.50mcg vitamin K.